Calendar Window and the Menu Detail window will appear (see image above). • To change the menu listing order, click the item you want to be moved and use the arrows at the right hand side of the window. 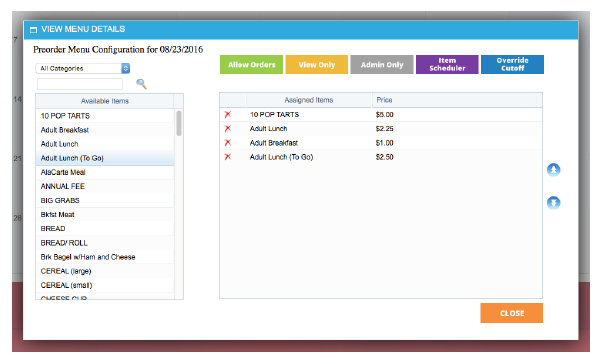 • Once your items are assigned, you may then choose your menu status to “View Only” (parents can view), “Allow Order” (parents can view and order) or “Admin Only” (parents can not view or order) by clicking the buttons above your group of assigned items. • When you finish configuring your menu, click the close button at the bottom right hand corner.When you have completed this process, your menu will appear in the calendar date you had originally selected.